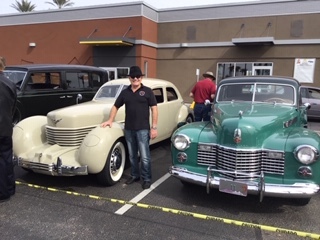 Once again, the Arizona region of the Classic Car Club of America brought their Classics to the Pavillions Car Show. With each car contributing $25, over $500 was raise for McDonald’s charities. The day started with lunch at Babbo’s Italian Eatery, followed by a display of member’s cars in our pre-arranged spot by McDonalds. The crowd always seems to enjoy seeing the older cars and this year was no exception. Beautiful weather, good friends, and great cars – the recipe for a fanatic day.